... for more information about a specific dog? ... about adopting a dog? ... to learn the status of my adoption application? ... if I found a basset hound or know of one in a shelter? If you have found a basset hound, please do not contact BROOD because by law we cannot accept it. Please take it to your local shelter. If they are unable to find the dog a home, the shelter will contact us. Bassets currently in shelters should be referred to BROOD directly by the animal shelter. ... if I have lost my basset hound? Please check with all animal shelters and humane societies in your area. Petfinder has useful information on ways to help locate your dog. ... if I need to give up my basset? Sorry, but BROOD no longer accepts owner relinquishing dogs. Please read about owner giveups. ... if I need financial help for veterinary bills? While BROOD cannot provide financial assistance, we do have information that may help. ... about events other than the Ramble? 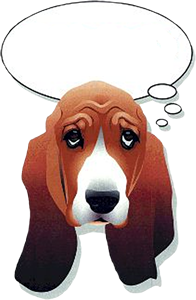 ... for help with basset behavioral problems? If your basset was adopted from BROOD, you may contact who will refer you to our training coordinator. Other helpful sources of information are the Association of Pet Dog Trainer website or Petfinder also has information on training your dog. ... for problems with the website? ... if my question or problem is not listed here?